My concentration levels aren’t always good when it comes to studying, so I found a solution. When you combine something you love with something important, the two merge together seamlessly. When I started my A Levels, I bought a Moleskine (accidently). The purpose of it was to work as a little sketchbook, but I bought the notebook instead of the one with thick drawing paper. But I decided to re-write my notes whilst adding little illustrations. It actually made revision fun. It almost felt as if I was putting a book together and everytime I read it on the bus I felt quite pleased with myself. – Once it’s finished you can carry it everywhere instead of carrying big heavy text books around. – By writing/drawing it yourself it’s more likely to add semantic value to it – meaning you’re more likely to remember it. 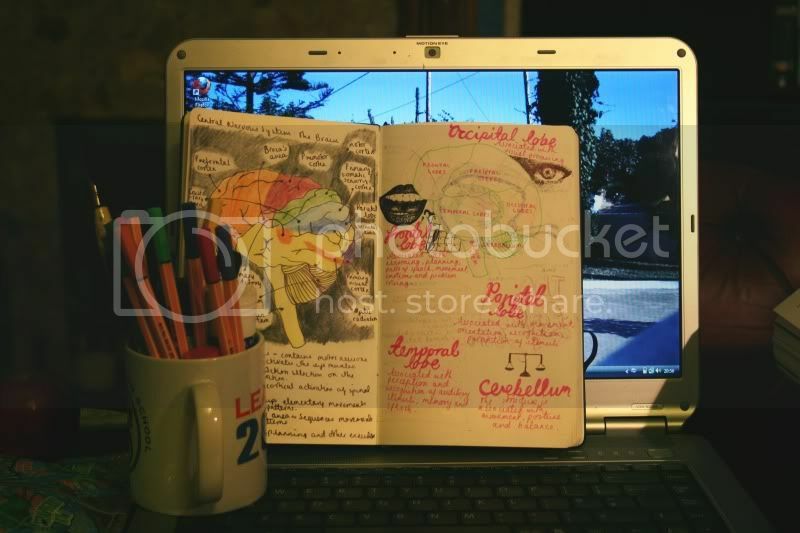 – After reading it a lot and looking at the pictures you’ve drawn you’ll be able to visualise the pages in the exam. I could go on. But seriously guys, it’s much more fun than just writing on lined paper or just simply reading your notes. I don’t think you take them in as well that way, somehow. This is actually a very good idea! I'm definitely going to give this a shot – if anything just for the fun of it! I sometimes find it hard to remember things and sketching them into small pieces of art would definitely help process it. Great post!! I always take notes in my sketchbook (for some classes at least). It's so useful because I learn visually so when I'm taking notes and drawing information out, I learn better than just taking plain notes. Your study-drawing is so cool! Unfortunately, I'm terrible at drawing, so that I avoid it even with things like anatomy, where you're meant to draw. This looks like a great idea. I also have a hard time studying, but mostly i get by. what a great idea! I've never thought of this, but I might as well try it…as soon as I saw the picture I smiled because I just learned this in psychology too!